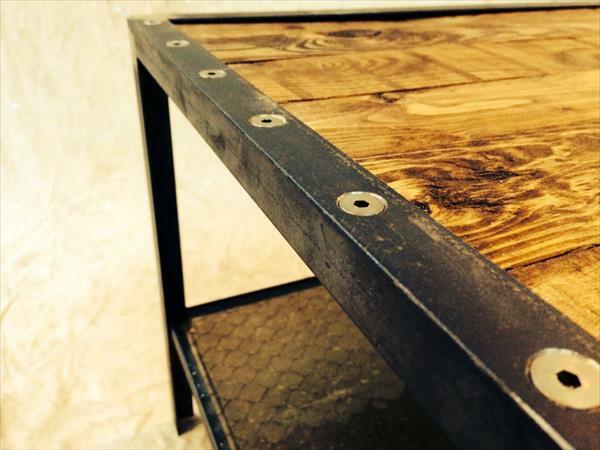 Here we are with a very well build DIY industrial pallet coffee table inspiration which is unique in its trends. We have constructed it from disassembled raw material of home which has been creatively reassembled to form this dainty DIY pallet table. This piece of DIY pallet furniture in more sturdy than previously constructed table models due to metallic legs. The attachment of metal legs not only make it well stand but give it a durable nature which would be under service for many years to come. An old glass window with chicken wire has also been reclaimed to recover the under shelve of the table out of it. So wherever you will make access to pallet wood grab it to find the highly utilitarian objects of home in it. To finish off this table any imaginable color can be given to it as a perfect overcoat or theme. For more fun the faux flower centerpieces and vases can be uploaded on the top to overcoming and tempting display of this handcrafted table pattern.